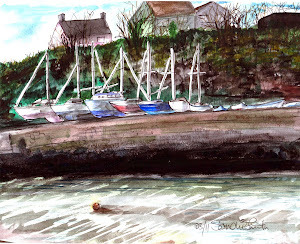 Well I certainly got lots of driving practice today; I offered to drive Pam to the festival (Salva a Terra) which we thought was at Idanha a Nova; well it wasn't, it was in the municipality of Idanha a Nova, but nowhere near the village of the same name. I ended up driving for nearly 2 hours to get there!!! We stopped and asked for directions several times, and everyone gave us different instructions, it was mad - but very good practice for our Portuguese language. When we got there we were so disappointed .................... apart from the fact there was practically nothing there we were far too early, we stayed a couple of hours then drove home - I don't think we'll bother to go next year!! Fortunately we didn't pay to get in. This morning we helped P&M erect their teepee, it's quite a complex procedure; first you tie three poles together at the top and raise these to form a tripod, then three more poles are introduced at each of the three apexes of the original three poles, then you have to wrap the canvas around the poles (after folding and tying it along a pole so that it can be easily unfolded) - suffice to say it's a skill!!!! Anyway it's up, and we left P&M fastening it down to the platform. On our way back along our track we came across an English plated camper van driving towards our quinta. It pulled off the road; so, being nosy, we stopped for a chat. It was an English couple who were coming to have a second look at some land that they might buy. So we went to have a look at their land, then they came back with us to see our quinta and have a cup of tea - and that was our day gone (it's a hard life). Louis started cutting our grass this afternoon, the land just below the building we are living in; Brett went off to train and I spent the whole time he was away hoping that Louis wouldn't come and try to speak to me, I'm far more confident when Brett is with me, and I don't want to resort to miming again!!! This evening we went round to P&M's for dinner; we noticed that the people we met earlier were 'wild camping' in the village. 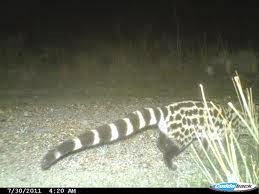 When we drove home through the quinta we disturbed a creature we have never seen before, we think it's a GENET (no I've never heard of one either), we didn't get a clear view of the body but the tail is quite distinctive. No we didn't manage to take a photo! I got this off the internet.